Currently feeling overwhelmed with some family medical news, which I’m not able to discuss publicly yet. In a week or two. Instead, some links I’ve found interesting. The Data Driven Life: An article from Time Magazine that’s about me. Or people very like me. It’s about the obsession with tracking, the usefulness and the pitfalls. A friend mentioned the meet-ups sponsored by QS to me some time back, and I’d been meaning to check one out right around when my kidney infection hit in January. A history of BMI : Great links. Lovely research. Makes me happy. This says pretty much everything I’d want to say. BMI is not an accurate indicator of health, or actual overweight. Body measurement, skin calipers, and hydrostatic weighing are far more accurate. I’ve been tracking body measurements for a while, and will no doubt post that spreadsheet in the future. I found this via Jim Hines’ blog, where he posts about BMI and weight issues using himself, and his BMI. He also links to the Illustrated BMI from a few years back, which I loved then and still love now. I have a few friends in the accompanying Flickr photo set. Utility Belt! A friend recently gave me this as a gift, after learning I’d been lusting after it for a year. I got mine in black. If I am very clever, I will eventually manage to get a picture of me wearing it. I’ve always envied Batman. Not because of the cool costume, or the mansion, or the Boy Wonder (definitely not because of the Boy Wonder) or even because of Alfred (though he’s pretty nifty). It’s the belt. Because the belt seems to carry just as much as Mary Poppins’ carpet bag, but is way more stylish. 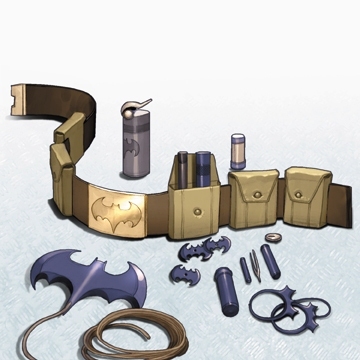 Believe me, I have far too much stuff I carry with me and a utility belt would be a blessing. Sim wearing her writer-girl utility belt. We made them in a V shape, which was more flattering for our girly curves than a straight across belt would be. I tended to wear the V in the front, while Sim tended to wear it on her hip. Both ways looked fine. 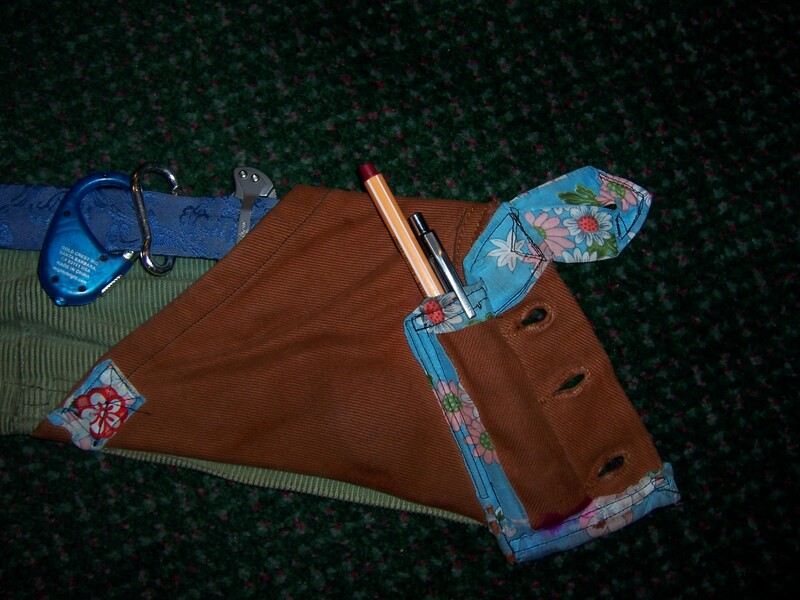 The main body of the utility-belt is made out of a corduroy skirt. 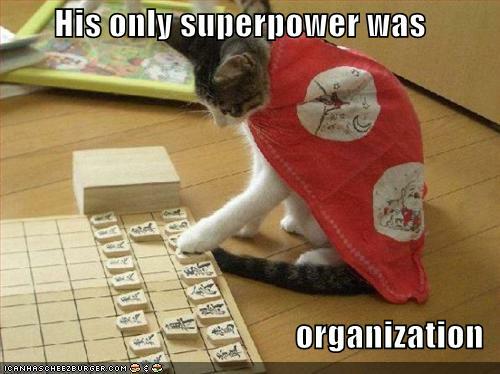 Then notice the buttons? Since buttons are notoriously hard to do on your own, we took that part from a pair of button-fly jeans. That portion is actually upside down and forms the center of the V.
We cut the flap that normally covers the buttons and folded it back, lining it with a decorative fabric and sewing it down to make a pocket for pens. As you can see, it fit two pens. The two pockets on either side of the buttons came pretty naturally from sewing the jean to the corduroy. Both pockets were the perfect size for holding a smaller moleskine notebook. They also fit phones/mp3 players easily. Although stuff could get a bit jumbled up. I found that the edge where the pocket met the corduroy was the place that most frequently needed repair. The belt laid out flat. Sim found a pouch she liked and sewed that onto her belt. It easily fit a paperback novel or a normal size moleskine journal (have you guessed that we’re both fond of moleskines?). I ended up deciding not to do that. That blueish fabric you can see forming the extra trim on Sim’s belt came from a cloth napkin. As you can see, you can hook carabiners on it. 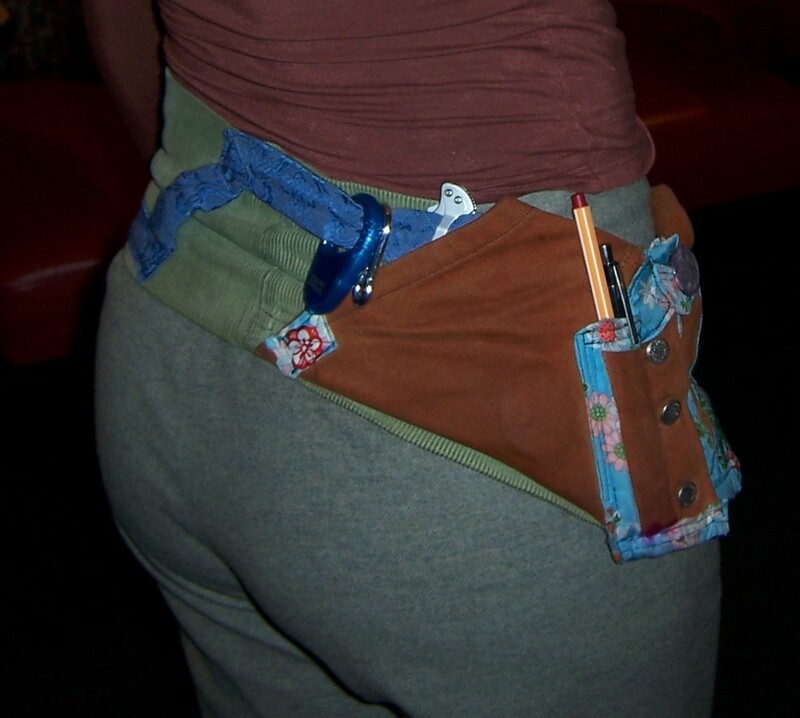 In this picture Sim also has her utility knife hooked on it. My version of the belt was all in black (of course) and we used a black cloth napkin to create the trim on mine. We both wore those belts until they fell apart. I still have mine, tossed into the trunk of my car in case I someday got around to mending it again, although, honestly, it’s probably too far gone for that. So, for now, I dream about utility belts. And obsessively research them online.